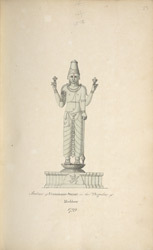 Watercolour drawing dated 1799 of an image of Varadaraja at Maddur in the Mandya District of Karnataka, taken from an Album of 56 sheets of drawings (60 folios) mainly of miscellaneous architecture and sculpture in the Deccan and S. India, dated 1793-1806, from the MacKenzie Collection. This sculpture is described in 'The Hoysala Temples' by S. Settar of 1992, "To find a group of sculptures that exhibit a perfect fusion of Hoysala and southern styles, one has to go to Maddur in the Mandya Dt. The images instanced so far...tend to lean heavily towards one or the other style in respect of their decorative details, while the images at Maddur literally combine the best in the two styles - the physical as well as the decorative details. The...larger Varadaraja image...is about 10 ft. in height and stands on a double-padma [lotus]... In general appearance, its physiology resembles that of a Hoysala work, particularly in its thick-set face and heavy concave-shaped torso. Of the attributes held in the four hands, the cakra [disc] and padma [lotus] are perfectly southern, the sankha [conch] is rather unique, while the gada [mace or club] is Hoysala. The lower is so elaborate and ornate that it is but southern set within the Hoysala schema. What is southern and what is Hoysala is difficult to make out here, for its artist has not selected different elements from different sources but has realised his own impressions about them in order to create something new... The waist-band, bangles, anklets, armlets and rings are either copied from or inspired by the Hoysalas, but the yajnopavita [a cross belt over the breast] and tika [necklace]are definitely drawn from the southern tradition. The crown is unusually long, with a gradual curve at the top, which, in turn, is surmounted by a padma-pinnacle. It has nothing in common with the Hoysala crown."